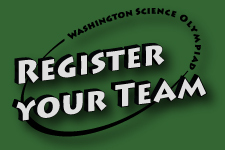 Welcome to the Washington Science Olympiad online! Science Olympiad is an international nonprofit organization devoted to improving the quality of science education, creating a passion for learning science and providing recognition for outstanding achievement in science education by both students and teachers. These goals are accomplished through classroom activities, research, professional development workshops and the encouragement of intramural, district, regional, state, national and international tournaments. Receive your own copy of the Science Olympiad Rules Manual (annually-updated description of events and parameters of competition). Whether you compete in Science Olympiad tournaments or not, use the rules manual to teach science ~ many schools have Science Olympiad classes. With annual changes, you'll have a great resource for students to learn and to love science. *No additional registration fee to compete; although teams need to pay their own travel and lodging expenses to attend tournaments. Members have the right to vote in Washington Science Olympiad elections and Board of Directors issues. 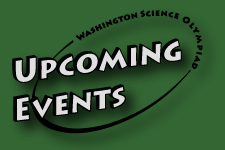 This affords you the opportunity to shape the future of Washington Science Olympiad. 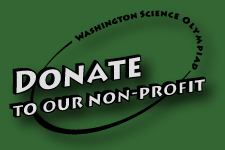 Most important of all, being a member of WSO means enriching the education of students in Washington State, and opening young minds to the exciting world of science! Register Online! New teams (ones that have not competed within the last 5 years) receive a discounted fee of $150 ~ although some new team registrations waivers are available. Contact State Director to check on availability. Returning teams' registration fee is $250. Fees include $60 that is sent to National Science Olympiad (NSO) to cover the cost of rules manuals, tournament medals, and other NSO-supplied items. 15112 W Third Addition Rd. Copyright ©2006 Sam Buzby Design, Inc., All Rights reserved.